NPHS sophomore Annaliese Fox is headed to the State Finals, qualifying as an individual from Saturday’s Lapel regional. The New Palestine girls golf team shot 351 and finished sixth in the 18-team Lapel regional Saturday afternoon. The top three teams and top five individuals from non-advancing teams advance to the State Finals. Fox was fourth among the top five qualified individuals. Fox shot a 41 on the front nine and a 36 on the back to shoot her 77 and qualify for the State Finals for the first time in her career. The meet will be next Friday and Saturday at Prairie View Golf Course in Carmel. 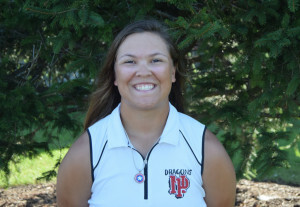 Mackenzi Black shot an 85, Izzy Gray 92 and Regina Olsen 97 to round out the Dragons’ scoring. Annaliese Fox is headed to the State Finals.